The University Archives collections can be found by searching the Archival Collections Portal. 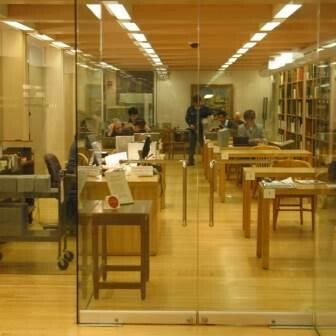 This portal provides access to records of archival collections at Columbia University Libraries, including finding aids, collection descriptions and some of the available digital content. The Columbia History Resources section of this site includes selected University-related digitized materials. The Collection Overview section of this site also provides description of the most highly accessed University Archives manuscript collections, how they are organized and for what topics you may find them useful. This is not a comprehensive listing of all of our collections. In the Archival Collections Portal, please click on “Columbia University Archives” in the list under “Search Repositories” and then click on “go” with nothing typed in the search box to pull up a list of all of University Archives cataloged collections. The Columbiana Library is a large book collection consisting of university-related publications. Many of these titles can be found in CLIO, the Columbia Libraries online catalog. In addition to CLIO, there is a paper card catalog in the University Archives reading room that can be used to find these publications. The card catalog is also useful for finding specific articles from two major university publications: Columbia Alumni News and Columbia University Quarterly. The Columbia University Archives staff has put together some Research Guides to help you take advantage of our holdings. For each type of search, you will find the most popular resources available and how to access them: some online and some in person. The lists are not exhaustive; these are only the "top" or "most frequently consulted" resources. The guides focus on alumni, faculty, course descriptions, Master's essays and dissertations, and buildings and grounds information. 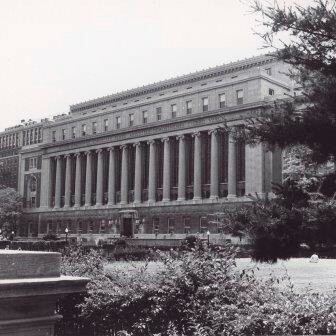 If you need help in identifying what materials you need to learn more about the history of Columbia or to find information on a former Columbia student, faculty or staff member, please contact uarchives@columbia.edu. Materials stored onsite can be made available on the same day and will be paged when you sign into the Reading Room. However, due to space constraints, many collections and all archival Master's essays and doctoral dissertations are housed offsite and require advance notice for retrieval. We prefer 5 business days advanced notice to retrieve materials from offsite storage, but require at least 48 business hours to process such requests. If you are not sure if the collection you are interested in viewing is stored offsite or if you need materials sooner, please email uarchives@columbia.edu to see what can be arranged. The University Archives collections are open for research and reference use by all members of the University community and the public. All materials are non-circulating. While no appointments are necessary, we strongly recommend that you contact University Archives staff before visiting. Many collections are stored offsite and others may have access restrictions which require advance planning. In order to use the collections at the University Archives and Rare Book & Manuscript Library (RBML), visitors are required to register their own Special Collections Research Account before their visit and to validate the account in person with government-issued photo identification or Columbia ID card. You will be asked for a current address, telephone number, and other contact information. Please use your Special Collections Research Account to request material prior to your research visit. To do so for collections with web-based finding aids, search for the collection via the Archival Collections Portal, open the container list portion of the online finding aid, click the check box for the box(es) you need, and then scroll back to the top of the container list document and click “Submit Request” button in the red-rimmed box at top. You will then have the opportunity to schedule a date for your request(s) and after clicking another “Submit Request” button you will be prompted to log into your account. Once you do that you should see the requests listed. For catalogued books or publications, search for the title on the library's online catalogue CLIO and then click on the link that says “Request from Special Collections”. At this point you may be prompted to log back into your Special Collections Researcher Account to schedule the retrieval date and once you do that you should see the request listed in your account. As part of our commitment to intellectual accessibility, the Rare Book & Manuscript Library (RBML) informs the public of the collections in our custody, even if they are not fully accessible to researchers, and make basic collection-level records available immediately upon accession. We make every effort to give our researchers access to the collections, whenever possible, by doing a quick assessment of what can be seen without processing. An unprocessed collection might be partially or fully closed for research if the materials in question are excessively fragile, impossible to locate due to lack of arrangement within the collection, or contain sensitive information. Collections that are unprocessed have a restriction note in the library's catalogue CLIO that states,"Material is unprocessed. Please contact rbml@columbia.edu for more information." If the collection has been previously requested and evaluated for access by an archivist, the outcome of that review will be reflected there as well. Please contact rbml@columbia.edu describing the unprocessed collection you wish to access. An archivist will review the request and will determine whether the material can be made available in the reading room. You should hear from us within two weeks. After my request has been reviewed, do I need to make an appointment? If the collection can be made available, we will ask you to confirm the date and time of your prospective visit before arriving. The materials will be ready for your viewing at that time. Because such collections are unprocessed and somewhat fragile, you will be seated at one of the five reading room tables closest to the manager's desk. This will allow the reading room manager to more easily assist you with any handling issues that may arise, and help to prevent damage to the materials. Please be especially careful when handling materials from unprocessed collections. If you see something that you feel unsure about handling, either because of its condition or its format, do not hesitate to ask for assistance. If the item you wish to see does not have an online finding aid or catalog record please contact uarchives@columbia.edu for assistance. Butler Library, north facade, undated. The University Archives is part of the Rare Book & Manuscript Library (RBML) on the 6th floor of Butler Library. Butler Library is located on the south end of Columbia’s Morningside Heights campus. The back of the library faces 114th Street between Broadway and Amsterdam Avenue. There is only one public entrance to Butler, from the campus side; there is no street entrance. If you do not have a Columbia ID card, please proceed to the Library Information Office (LIO) immediately to the left of the security desk inside the front door of Butler Library. Here you will tell LIO staff that you are conducting research in the Rare Book and Manuscript Library (RMBL) and will have to present a government-issued photo ID in order to obtain entrance to the library. LIO will issue you a temporary access pass that provides access to RBML. When you have passed the security desk, follow the hallway left and take the East elevator to the 6th floor. The entrance to RBML is through the glass doors at the end of the hallway, to your right. Lockers for coats, jackets, bags, and other personal items are located just outside the entrance; keys are available at the RBML reference desk. Rare Book & Manuscript Library (RBML) reading room. We ask that you observe the following reading room policies in order to ensure the integrity and security of our collections. Registration with photo identification is required. Personal belongings, including coats, hats, rain gear, purses, briefcases, computer cases, camera bags, parcels, envelopes, and portfolio folders are not permitted in the reading rooms; we provide lockers to securely store your belongings. Only pencils, cell phones, tablets, and laptops (without cases) are permitted in the reading rooms; you may bring a notebook, but please present it for inspection when leaving the reading room. Digital cameras (without cases) may be used in the reading room with most materials (tripods, flash, or additional lighting is not permitted). Please turn off the flash element and turn off any sound elements. The RBML cannot provide access to original time-based media material which has not been first been reformatted for preservation. Researchers are welcome to examine archival time-based media items and decide whether they wish to place an order for Audio/Video reformatting. All materials must be returned to the reading room manager before leaving the reading room. Arrangements for future use may be made at this time. Any personal materials, including laptops, which were brought into the reading room will be inspected by a staff member when a researcher leaves the reading room. We reserve the right to search any notes or personal belongings at any time. Please handle materials carefully. In the case of book requests or bound materials, foam supports and book weights will be provided for you. Gloves are required when handling photographs, film, slides, or metal objects. Please use only one box and one folder at any time. In the case of manuscripts, please leave all materials flat on the table. Do not place notebooks, notepaper, or computers on top of material. Please maintain the existing order and arrangement of material. If you suspect that an item seems to be out of order, please inform a staff member. Access may be limited under the following conditions: when papers are being processed; a result of donor-imposed restrictions; or when their physical condition warrants restricted use. In cases of collections in process access staff will work with you to facilitate access wherever possible. Photocopying is provided as a service; personal copiers and scanners are not permitted. For more information on handling materials in the reading room, please consult the RBML's brief instructional videos.